This download of ZBrush 4R6 Software from Pixologic is a digital sculpting tool designed for art students and gaming and film professionals. ZBrush 4R6 combines 3D/2.5D modeling, sculpting, texturing, and painting, and may also be used to create models that have up to 10 million polygons. Using "pixol" technology, it is able to store lighting, color, material, and depth information for all objects on the screen, allowing renderings to be viewed in realtime. ZBrush 4R6 improves upon previous versions of the software by introducing ZRemesher, DynaMesh, Group Front, Solo Dynamic mode, new brushes, and more. This version of ZBrush 4R6 is compatible with computers running Windows and offers 1 user a serialized license. This single license may be used on 1 workstation. Using ZBrush, sculptors can make global or local changes to their models. Medium and high frequency details that were traditionally painted in when bumps and wrinkles were applied to an object's surface can now be sculpted. High frequency 3D models may also be projected onto the background of a scene, where they become a 2.5D image. A 2.5D image is used to simulate the appearance of being three dimensional, when in fact it is not. Upon this 2.5D background image, further effects may be applied, allowing another 3D model to be composited into the same scene. Through GoZ, ZBrush offers integration with Autodesk Maya, Autodesk 3ds Max, Cinema 4D, Lightwave 3D, Poser Pro, Daz Studio, EIAS, and Modo. An automatic retopology system previously called QRemesher that creates new topology based on the original mesh. ZRemesher's new topology is generally more clean and uniform than with QRemesher. This process can also be guided by the user to make the new topology follow curves in the model and retain more detail to specified areas. Fibermesh is a feature that allows users to grow polygon fibers out of their models or to make various botanical items. It is also a way to edit and manipulate large amounts of polygons at once with Groom brushes. Allows ZBrush to quickly generate a new model with uniform polygon distribution. DynaMesh has been designed to create low and middle resolution sculpting stages, allowing a base mesh to be created before using the more powerful sculpting and editing tools. Also included is a full render suite known as Best Preview Render, which allows use of full 360° environment maps to light scenes using HDRI images. BPR includes a light manipulation system called LightCaps. With it, one can adjust how the lights in the scene are placed around the model. One may also generate environments based on the model and its light placement for future HDRI renders. BPR also allows for material adjustments in realtime. Material properties such as subsurface scattering are supported as are environmental and scan-line reflections. BPR also includes a set of built-in filters that can be used in realtime to create dramatic effects and corrections without requiring another photo-manipulation program. A user can create a base mesh with uniform topology and then convert it into a sculptable model. This is accomplished by starting out with a simple sphere and extracting more "ZSpheres" until the basic shape of the desired model is created. ZBrush also gives you the ability to sculpt in 2.5D, and comes with several brushes for that purpose. A pixol created when sculpting or illustrating in 2.5D contains information on its own color, depth, material, position, and lighting information. ZBrush also has a feature that is similar to skeletal animation in other 3D programs. The transpose feature allows a user to isolate a part of the model and pose it without the need for skeletal rigging. The Group Front feature detects all polygons which face the camera and assigns them to a single group. This tool will let you create special effects by using your point of view, such as deformation of only the parts of your model that are visible to the camera. 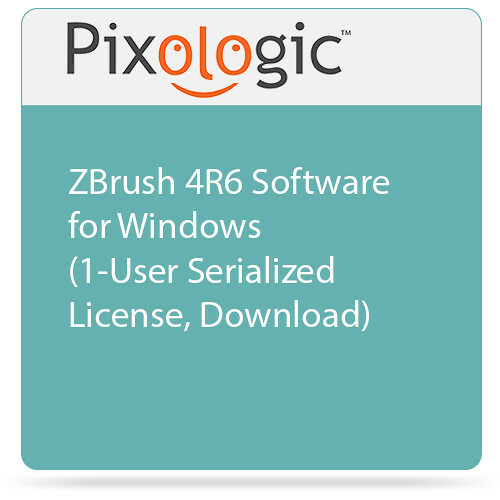 This Single User License of ZBrush 4R6 allows you to use the software on one system. Up to 3 additional copies may be purchased for use on other separate systems before a Volume License is needed. Each copy receives a separate serial number which is assigned to a single user and activated using the internet, phone or email. The software can be deactivated over the Internet, making it possible to move ZBrush between computers. Single User copies have a "Home Use" rule which allows them to be installed and activated on two computers (such as a desktop and laptop or a work computer and home machine), provided that both copies don't actually run at the same time.